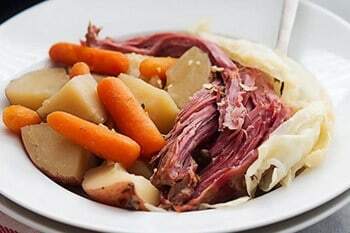 Corned Beef and Cabbage is often considered a quintessential Irish fare for St. Patrick’s Day. A moist, tender and intensely, beautifully flavored brisket with comfort food favorites of potatoes, carrots, and cabbage. Place potatoes, carrots, and onion in 6-quart slow cooker. Pour 3-4 cups of water over the vegetables, enough to just cover. Place the corned beef brisket over the vegetables. Sprinkle with pickling spice and minced garlic, cover, and cook on HIGH for 7-8 hours. One hour before the brisket is done, add the cabbage, cover, and continue to cook for that additional hour. Remove the corned beef brisket to a serving platter and slice thinly across the grain. Serve with vegetables. Place corned beef in large pot or Dutch oven and cover with water. Add the pickling spice and garlic. Cover the pot and bring to a boil. Reduce the heat and simmer about 50 minutes per lbs or until very tender. Add the whole potatoes, carrots, and onion to the pot. Cook until the vegetables are almost tender. Then add the cabbage wedges and cook for 15 minutes more. Remove meat and let rest 15 minutes. Place vegetables in a bowl, reserve the cooking broth and slice the meat across the grain.